Ever since I made my White Sox Michael Jordan card in the style of the 1990 Fleer baseball set I've been eager to use the template again. I almost used it for a Jim Belushi Cubs card from the 1990 movie Taking Care of Business, but that just wasn't doing it for me so I scrapped the card in mid design. 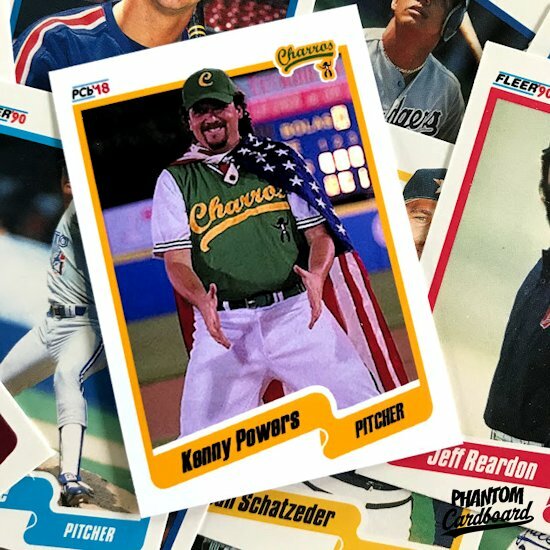 Then one day last week I got an inspiration to make a Kenny Powers Charros card using the '90 Fleer template. Season 2 of Eastbound and Down was every bit as funny as the first season, and that first season was an absolute riot. This is actually the third Kenny Powers card I've done. I've still got to get around to posting the other two on here. I'm not a huge fan of any Fleer baseball design outside of this year. To me they're usually kind of boring designs. The 1990 design is clean. I like the white background with the color coordinating borders and the flowing nameplate. I also like how the players break the top border.